LinkedIn marketing can seem like a riddle wrapped in a puzzle caught in an enigma to many business owners. Many small business owners, especially those in the business-to-business (B2B) space, login, connect to a few people they know and then come back to the network when they’re in the need for a new hire or two. One of the firms working on LinkedIn is Tidewater Roofing, who not only have acquired clients via LinkedIn but used it effectively for strategic partnerships, hiring as well as connecting with other entrepreneurs in the area to increase networking opportunities and word of mouth. But there are some great examples out there of smart marketing for small businesses and even B2B businesses on LinkedIn. One of those small, B2B business owners is Don Robinson. 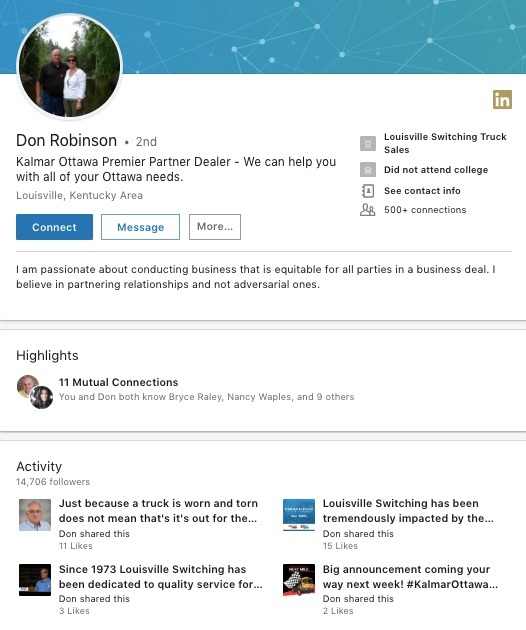 Don is the CEO of Louisville Switching. The company sells, leases, rents and provides service for Ottawa Trucks, which are job-site specific vehicles you might find on a construction site, in a large manufacturing complex or other expansive property where people need to move themselves and supplies around, but not using a fleet of road-legal vehicles. Think of them as golf carts for industrial sites. The company has a modest LinkedIn presence — less than 200 followers in fact. But they publish nice videos on the company, its products and services, and serve a very small niche in the area around Louisville, Ky. But Don is a different story. Don Robinson has over 15,000 followers on LinkedIn — and many of them are engaged with his content. He posts content, including the company’s videos, regularly. Most company video views greatly exceed the number of followers they have just because Don posts them. What’s Don’s LinkedIn Marketing Secret? 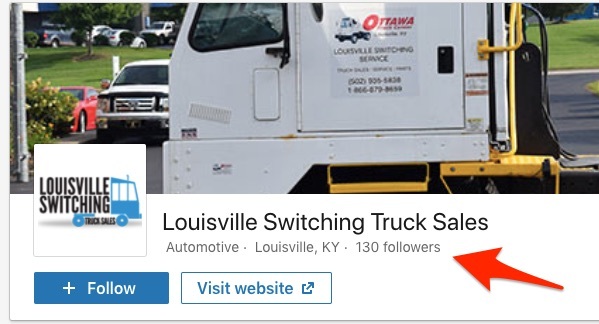 Whenever a new lead or customer comes to Louisville Switcher, Don looks up the pertinent client contacts on LinkedIn and sends them a friend request. 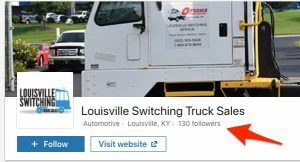 The gesture opens a direct line to the boss for prospective customers and sends a very emphatic signal that Louisville Switcher is a customer support driven company with a lot of transparency. They’re a company you can trust. Imagine filling out a lead-gen form on a company website only to be sent a friend request by the CEO the next day on LinkedIn. Now imagine the CEO actually sends you a personal note to ensure you’ve gotten all your questions answered after you requested information from his company. How can you not want to do business with them? What Don Robinson proves is that you don’t necessarily have to spend a lot of time or money creating content and blogs and such to be successful using social media. Sometimes, B2B and small business success, especially with LinkedIn marketing, can be as easy as an old school follow-up. Did you get what you needed? Can I answer any questions? We’re connected here, so be sure to let me know if you need something to help make your decision! How amazing is that for a customer experience for a small B2B company? How amazing can it be at scale and fast? So even for large B2B companies, have your regional sales person send friend requests to new leads within hours or even minutes of them filling out a form? What are your LinkedIn Marketing ideas? Don Robinson is just one CEO doing one cool thing to help his company’s marketing on LinkedIn. What tips and tricks do you have? Jason Falls is a digital marketing keynote speaker, author and strategist based in Kentucky. He is perhaps best known for founding the popular marketing blog SocialMediaExplorer.com. Falls spends his days leading digital strategy for Cornett, a Lexington, Ky., based marketing agency.